When you visit France, it's easy to be overwhelmed by the astonishing variety and abundance of gorgeous pastries everywhere – it seems like there are patisseries on nearly every street corner, all filled with enticing cakes and tarts of every color and flavor. Even with all this sweet tooth overload, I can still remember the eclairs standing out to my eyes – I'd always thought eclairs came in one color and flavor but Paris' pastry chefs proved me totally wrong. Much like macarons, eclairs seemed to have become a sort of springboard for pastry chefs' creativity, and I saw eclairs in all sorts of flavors and colors. Here are some in dark chocolate, white chocolate, and cappuccino flavors. Some beautiful cherry blossom eclairs from Fauchon, one of Paris' biggest and most famous patisseries. 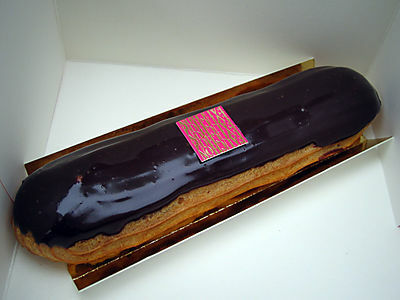 There's nothing plain or boring about a classic eclair when it comes from Fauchon – look how gorgeous it is! Finally, I'm not 100% sure these are eclairs but they're too cute not to include – the sweetest little piggies! So with memories of Paris floating in my head I was excited to take Pierre Hermé's not-so-ordinary-either chocolate eclair recipe and see what variations I could come up with for Daring Bakers. The nice thing about eclairs is that although they may look intimidating to make, they're actually one of the simplest pastries to recreate in the home kitchen, which makes experimenting all the easier – and fun. For my eclairs I went with the classic Vanilla Pastry Cream filling, along with some strawberries on top; a Chocolate Pastry Cream with Candied Orange Peel, and Matcha Pastry Cream with Black Sesame. Sweet, rich, or exotic: take your pick! The Vanilla Pastry Cream is also from Pierre Hermé's Chocolate Desserts book, and I made the Matcha Pastry Cream by adding some matcha powder to the vanilla pastry cream and lightening it up with some whipped cream. A few more varieties and I might have enough to fill a pastry shop window! Thanks to Meeta and Tony for providing a great Daring Bakers Challenge this month! Wow, your eclairs came out gorgeous! I really love the cherry blossom eclair, it’s so cute! Gorgeous photos. Thanks for including the Fauchon shots. I didn’t get there when I was in Paris last fall, but I did visit one of Herme’s places. I was not disappointed. There are a few photos of that on mine. Gorgeous photos. Thanks for posting the ones from Fauchon. I didn’t get there when I was in Paris, but I did visit one of Herme’s shops. I was not disappointed. There are a few photos of that on my blog. These look beautiful! I loved looking at all the pictures of eclairs. I want to go to Paris someday and visit all the bakeries! beautiful anita! i also made matcha pastry cream and matcha pate a choux. lovely. They’re beautiful!! I love how you tried different pastry cream flavors. 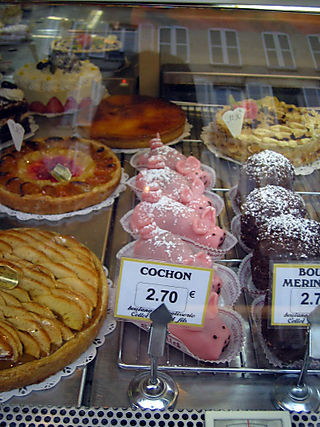 *And,* those pictures of French pastries are so delightful…especially the cherry blossom eclairs and the adorable piglets! Beautiful eclairs! You did a wonderful job. Anita, all your éclairs look fabulous! Love the photos! How lovely you eclairs look. And how creative. Fauchon would be proud of these. Bravo! yours came out perfectly. I love the black sesame one–though now i am dying to try the cherry blossom one. I think your trio of eclairs would fit right in with those in the French shops. Absolutely beautiful! 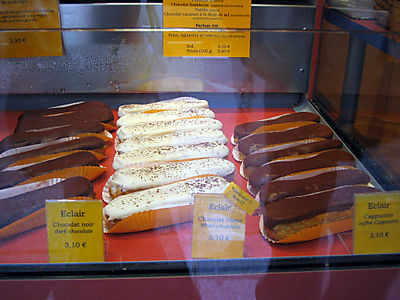 And you know, it occurs to me that I haven’t had eclairs since… well, it must be about 10 years since I had one. How the heck did that happen??! Goodness. Must rectify that. Thanks for the interesting pictures! All of your pastry creams sound delicious! Your are so gorgeous I couldn’t tell the difference between the ones from Paris and the ones you made! All the pictures are so breathtaking and yummy! Such amazingly beautiful éclairs! Your flavour combinations are wonderful, too. Lovely eclairs! Your photos are amazing. As always, your food is set to impress. Well done. As usual yours are a work of art! Wonderful! If only I could put my hand on the rest of my matcha I would so make a variation like that. I have an inkling by looking at the puppy’s paws that he found the bag on the lower shelf…drat! I’ve never imagined that eclairs can be so versatile!! I especially love the cherry blossom ones!! I see you’ve had more success with Pierre Herme’s chocolate glaze more than I have; mine turned out dull when it cools down…sigh…just my luck i guess. Should’ve stuck to my tried and true choc ganache recipe. Beautiful eclairs!! 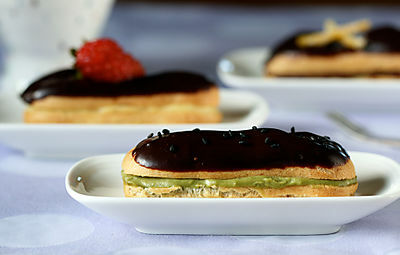 I’m not a choux pastry person but your eclairs look stunning! The matcha ones remind me of Sadaharu Aoki’s creations. Somehow I just never got my eclairs to look “right” back in pastry school. I’ve had eclairs from Fauchon. Pure bliss! Yours look just as lovely! I love all of the interesting additions you made. i could not wait to see your creations and ides. i knew there would be matcha in there somewhere lol! anita – they look great! 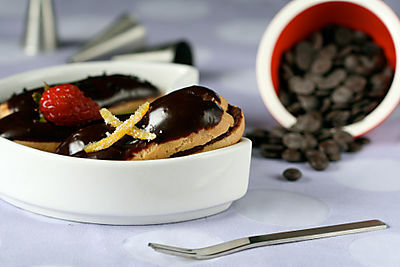 eclairs (the chocolate ones) are one of my favourite pastries. I wish I was able to make them. Yours look gorgeous, fantastic job ! yummy and beautifully presented! I would love someday to have the same flair that you have! Well done on the challenge! Loved all the varieties you made! Never had an eclair with matcha pastry cream before! I love the added flair!! Your eclairs and photos are perfect like always! Ooo, your eclairs look amazing! Beautiful photos as well!! Wow–I’ve never seen such beautiful pastries. Love the pigs! The chocolate-orange ones sound amazing! That is definitely my favorite flavor combination, yours look fantastic. 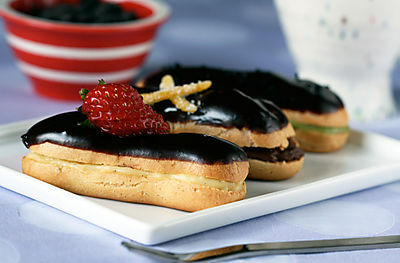 Your eclairs sound delicious and look wonderful! I’m sure you’re showing your bf the pix I have on FB too? Some good ones there (if I do say so…) If you’d ever like to meet her/us just let me know when you’re in the 650/408? She LOOOVES people. Thank you for sharing those eclair photos. I love the cherry blossom one. Your own eclairs look pretty perfect too! Makes me wish I’d tried decorating mine a little more creatively. I love your take on this classic. Matcha …. yum! I thought about doing the same, but did not have time to experiment. Brilliant photos as well. Your eclairs look fantastic. i love all the different flavour combinations you tried. Those cherry blossom ones were beautiful. 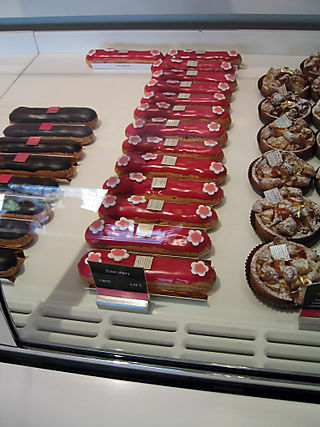 Your eclairs look nice enough to display along with the ones from France. The matcha cream is the most unique I’ve seen to date. Very nice. Nice job on your eclairs and I love your blog. Your pictures are beautiful and you write so well. I will be coming back often.